This is why you should never stand outside of a corner on an active rally stage: You could get very, very hurt. Photographer G David LeClair was hit Friday on Special Stage 2 of the Sno*Drift Rally this weekend when a car ran wide off the stage road. The stage was shut down after the incident and LeClair was taken to a local hospital, according to a statement Rally America briefly released, but then deleted from its website. The rally resumed on Special Stage 4. LeClair posted a Facebook update that was shared on several rally groups confirming that he broke his scapulas and lacerated his liver in the hit. The video shows LeClair standing in a place where you should never stand on a rally stage, exactly because something like this can happen. LeClair is on what’s called the outside of the corner. If a car comes into the turn too hot, spins out, or suffers any kind of mechanical failure, the car is going to slide off the road right at LeClair. The pre-race media meeting even instructed attendees not to stand on the outside of a turn, per Adam Bachi, who posted on Facebook that he was in that meeting. The area was also cordoned off with red tape, which is a standard way rallies mark off areas spectators are not allowed. This doesn’t look like it’s any fault of the rally, even though they seem to be understandably hesitant to address it. 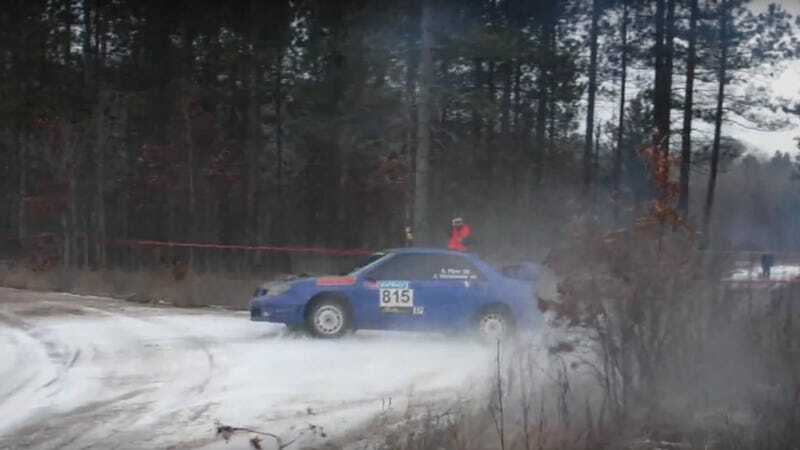 Rally America became the main body behind many former SCCA rally events after the SCCA suspended their rally series following an incident where two spectators were hit and killed on a rally stage. We’ve reached out for Rally America for a statement, but have not received any word back. This post will be updated if they release any more information. CORRECTION [10:40 a.m.]: This post originally misstated that Rally America was formed after the SCCA left rally, yet they existed in another capacity before then. This has been amended above.